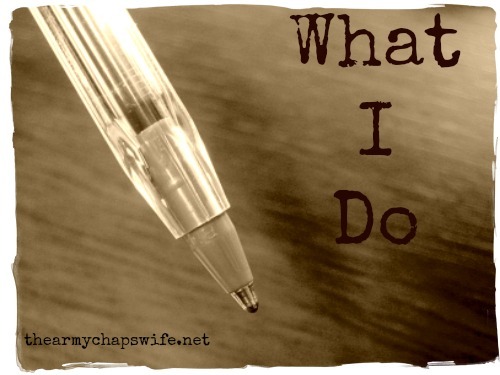 I am an Army Chaplain’s wife and a homeschool mom. I’m also a (part-time) self-employed work-at-home mom. But explaining to people what it is I do is, well, interesting. I guess if I had to put a title to it, it would be “Virtual Assistant: Editor/Proofreader.” Even that’s rather nebulous though. So I thought it might be fun to give a behind-the-scenes look at how I spend a portion of my time each day. The majority of what I do is centered around contributor blogs. I have, as my clients, website owners/managers who host contributing writers. These writers turn in their articles each month, and that’s where my job starts. I take each article and proofread it first for spelling, grammar, etc. I also edit the post for “readability,” structure, and flow while preserving the writer’s unique voice. Last, I work with the article’s formatting if it needs any. I try to make it visually interesting and appealing to the blog’s readers. For most of my website-owner clients, I schedule their contributors’ posts throughout the month and keep in touch with the writers (usually through Facebook groups). Sometimes I help create a list of topics or theme ideas for each month. The other part of what I do is work with ebook authors. In this age of digital media, self-publishing has become a viable option for those wanting to quickly publish their writing. It also means there is a plethora of ebooks out there now! Ebook authors who want to stand above the crowd really should consider spending a little money to hire the help they need to polish their work to its finest sheen. Having an extra set of eyes to catch spelling mistakes, correct any grammar issues, suggest alternate wording, and read for flow and cohesiveness is beneficial for any writer. And that’s where I help my clients. Obviously, this is a little more involved than editing blog posts. I’m still kind of old-school when it comes to reading books, so for the ebooks I edit, I print them out first and make notes on the actual pages then make the changes on the computer. For some reason, it’s easier for me to see the “big picture” of a book when I have it on paper. I like to read through the entire book once at first, to get an overall feel for it. Then I go back and start over with editing for content and flow. Last, I do the finer proofreading. 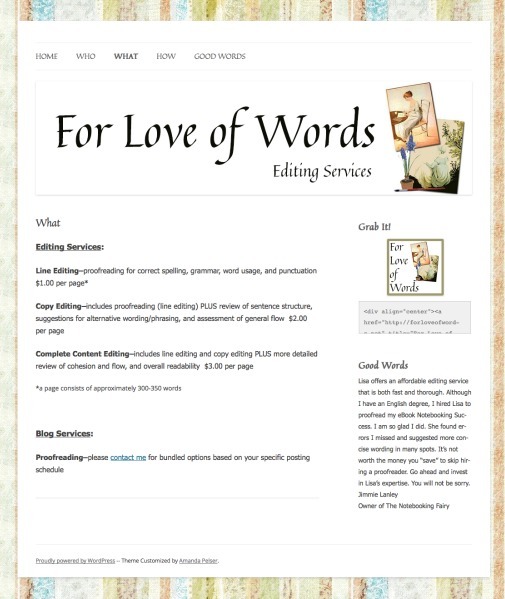 I usually do at least 2 rounds of edits for my ebook clients. Communicating with each writer, ebook author, and website owner is a key component to what I do, and it’s also a favorite aspect of my job. I thoroughly enjoy getting to know the people I work with! That sounds like a very interesting job, and I appreciate that someone is doing it. The number of blogs, FB posts, and ebooks I read that have glaring errors–sometimes just homonyms, but also other spelling and grammatical mistakes–it really detracts from what one is reading.